I recently visited the south of Germany. I stayed in the middle of nature at a campsite which is located only 9 kilometers from the Austrian border. 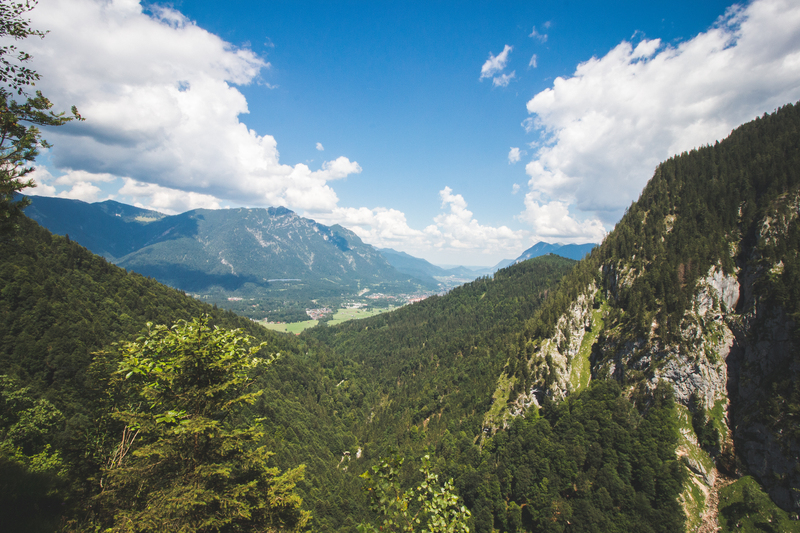 You wake up surrounded by mountains, the chirping of birds and splashing of the Isar, which is the river that comes from the Alps and flows across Bavaria. Living in the western part of Germany, I have never seen such beautiful and untamed nature. It was beautiful! But one of the best parts of the trip was our visit of the Höllentalklamm. The Höllental (english: Hell Valley) is one of the routes you could possibly take if you want to make it up to the Zugspitze, Germany’s highest mountain. 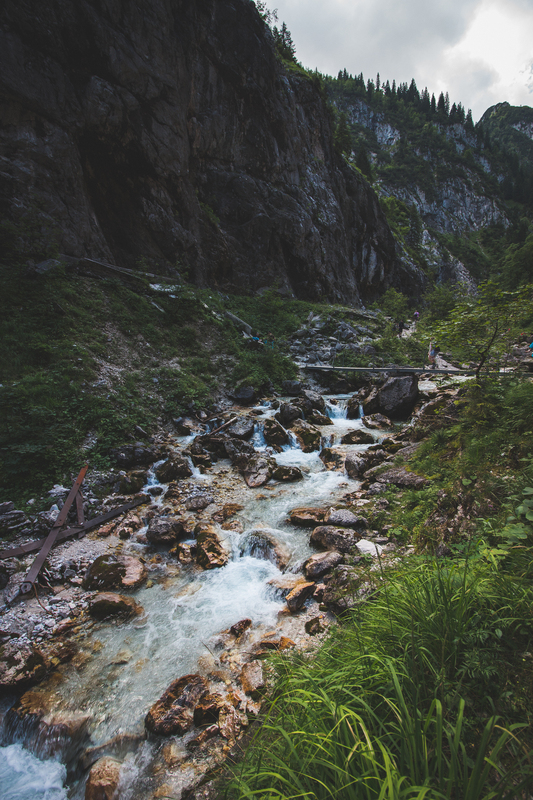 Well, we actually didn’t want to climb the Zugspitze, we were there to visit the Klamm – the best translation for that word would be canyon, I guess. It all starts with a mountain which is high enough to have glaciers on top. The ice is melting and forms a river that flows down the mountain. In many thousands of years the water carries off rock and digs into the mountain. That way you are able to follow the path of the river with the mountain on your left and on your right that towers high in the sky. Of course you cant just walk through the river. It is so strong that you wouldn’t even be able to stay on your feet, let alone you walk against the flow. Mother nature is incredibly powerful and people die every year because they mess with her. The touristic development of the Höllentalklamm took place from 1902 to 1905. Before 1902 the Höllental was significant because of it’s iron ore deposits. 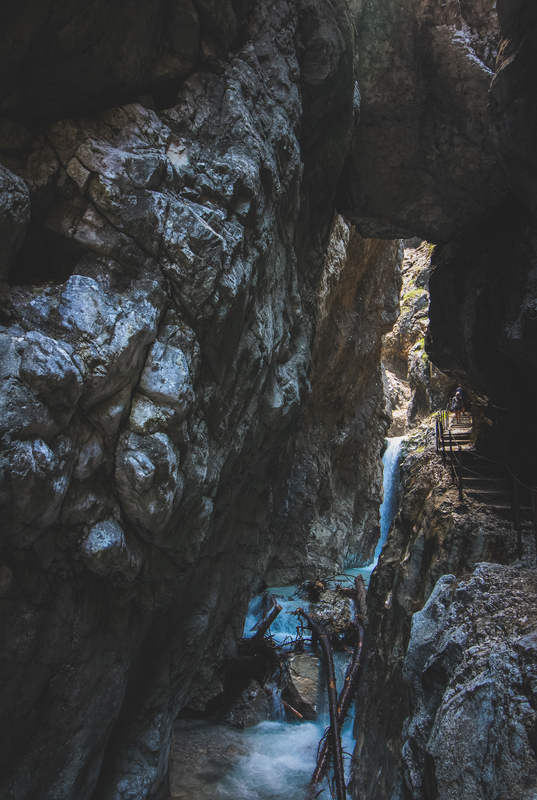 You could learn a lot about the history of the Klamm by visiting the Höllentalklamm museum that is located right before you start to walk the path through. I didn’t expect the way to be that wet and rough to be honest. I took my DSLR with me but had nothing to cover it from the water splashing from above and a rainproof jacket and waterproof shoes would have been useful as well. The path built from 1902 to 1905 is a mixture of tunnels and stairs that have been hewn into the mountain. The river flows on your left only a few meters below you but water runs down from above as well, as I just said. The ground is slippery and the tunnels are sparsely lit, so you have to pay attention to every step you take. After a while the path finishes in a beautiful valley. The river is calm there and because you just went through that dark canyon whose bottom the sun can not reach it feels like the calm after a really heavy and dark storm. Awesome feeling! During our stop at this oasis we talked to a man who knew the region quite well. He told us that we could take three different paths from there: the same path we came, a quite long path across the mountain and through the forest or we could cross the river at this point and take the so called Stangensteig. 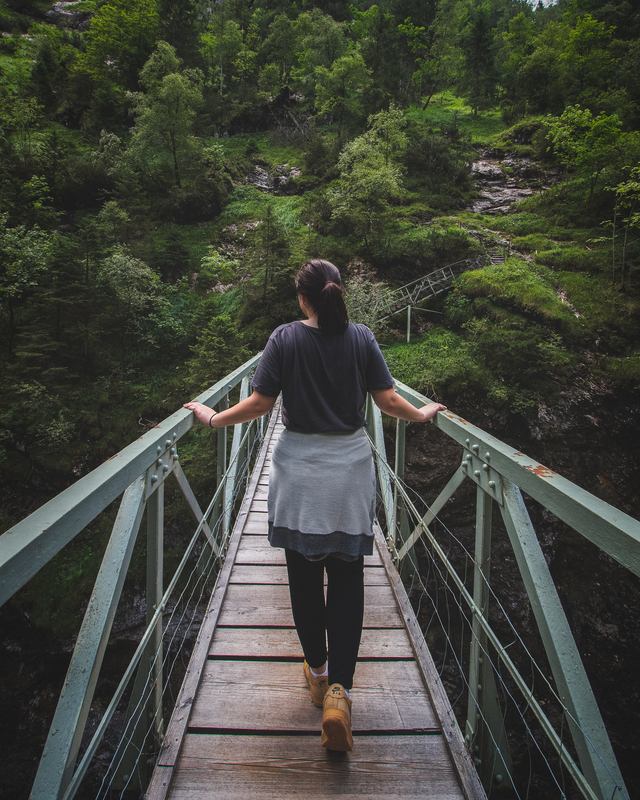 Since we wanted to see something new we didn’t want to go back and the second path wouldn’t have led us to Hammersbach (the place where we parked our car) we decided to choose the third option… and we did not regret! The path was way more dangerous the the path we came. There were some stairs here and there as well, but no railing and it was very narrow so we had to be way more careful then before. Most time you really only climb over huge boulders and you often think you’ve accidentally left the path and climb through undeveloped areas of the mountain. If you fall on the way we came you maybe hurt yourself a little bit because you’re surrounded by stone. 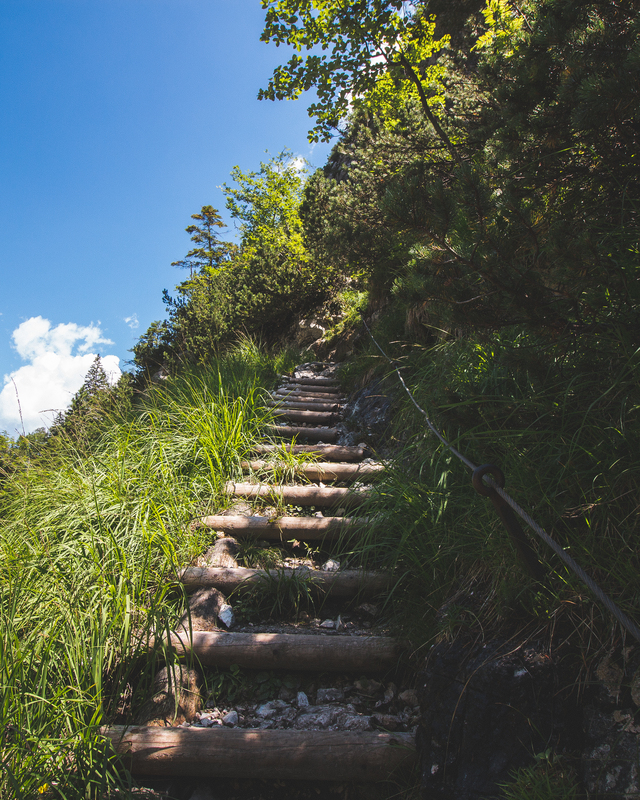 If you trip and fall on your way over the Stangensteig there’s a pretty high chance of falling back down to the bottom of the Klamm on your left and there’s no way anyone could possibly survive that. After some time we came to a bridge called the Eiserne Brücke (eng. : iron bridge). 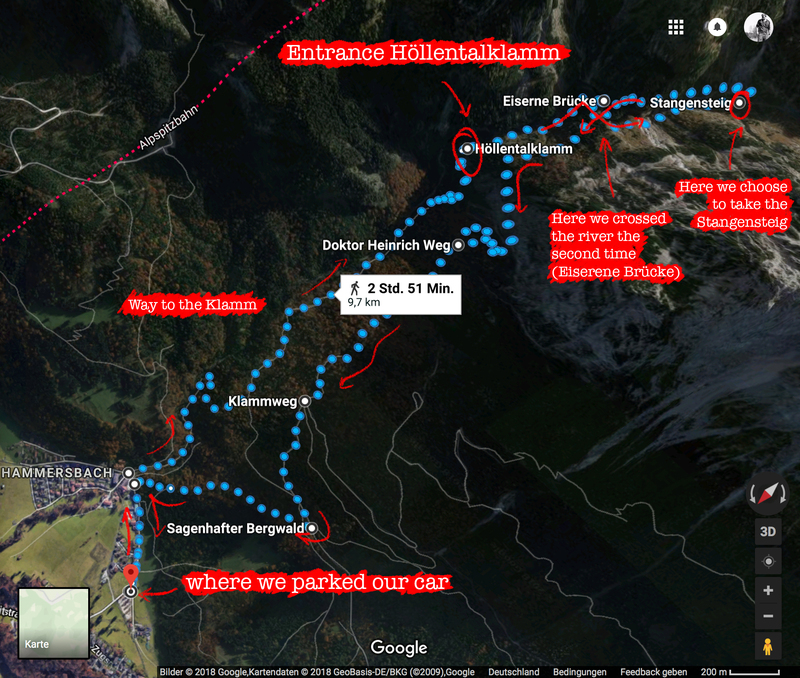 If you payed attention while reading this, you understood that we entered the Klamm and had the river to our left until we crossed it and took the Stangensteig in the opposite direction. The Eiseren Brücke crosses the river again but way higher above. We stopped in the middle of the bridge and looked down where we saw the path we first came like 20 meters below us and even further down the river. WHAT A VIEW! Standing up there and thinking about how we strained the way down there only like two hours ago was an indescribable feeling. The path guided us out of the valley and – again – higher up the mountain. From here, the Klamm to our right and Garmisch-Partenkirchen (the closest city to the Höllentalklamm) in front of us, we had an awesome view! No words needed, just look at this. From there on we walked through a forest down the mountain until we came out where we started. All in all it took us like six or seven hours to came back to where we parked our car and it was an amazing experience. If you ever visit the south of Germany somewhere near ht eZugspitze or cities like Garmisch-Partenkirchen and Mittenwald I definitely recommend visiting the Höllentalklamm or any other Klamm. This natural spectacle should not be missed.